Whoever it is who you blocked out in red in the first picture, is clearly ignorant of the facts. 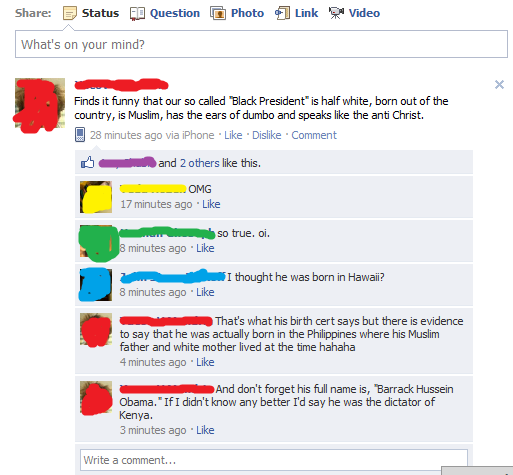 There is no evidence he was born in the Phillipines etc, etc, etc, because even the birthers aren't saying that. It's this kind of knee-jerk jump-on-the-bandwagon ignorance, that makes us neutrals wonder at their intelligence. Ditto "the monkeys aren't turning into humans" comments below that. As you didn't comment on the discussions I don't know your feelings about them. I hope it's not agreement. 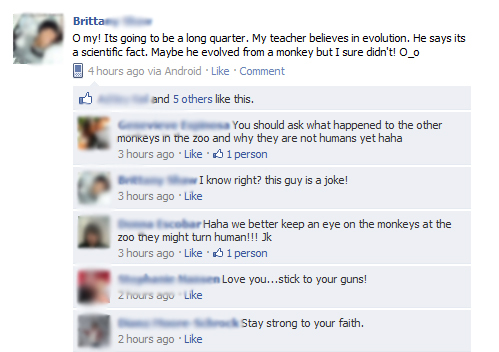 I love this common misconception you retards have about Human/Mokey Evolution. WE. DID. NOT. EVOLVE. FROM. MONKEYS. I hope that was clear. What happen was that HUMANS and SIMIANS has a COMMON GENETIC ANCESTOR. MEANING we didn't EVOLVE form MONKEYS but we both EVOLVED from the SAME ANIMAL. There's nothing to say about this blatant ignorance. For one, you have to be born a U.S. citizen to become president. For two, Islam is just a slight variation of the other two Abrahamic religions. Lastly, evolution from an ancestor species is way more likely than evolving from a pile of dirt.